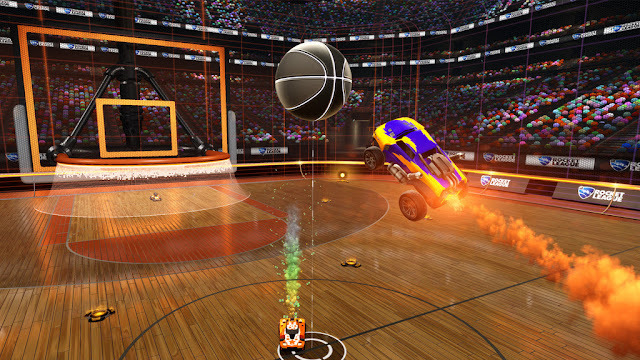 Rocket League, the incredibly popular motorized arena sportsball game is adding a new basketball themed mode next week. In keeping with their other numerous updates, the new mode will be offered for free on all available platforms. In addition to the free DLC, Psyonix has partnered with the NBA to offer a premium collection of NBA team flags for players to decorate their cars with. Rocket League continues to draw millions of players to its servers with these robust updates. Since its release in July of last year, it has partnered with numerous other companies to bring new content and DLC to the game and officially joined the Electronic Sports League. The first Rocket League Championship is going on right now, and watching some of the pro players is really incredible. I love the chaotic joy that Rocket League brings. I am not a good player by any stretch of the imagination, but I still think that it is an immense amount of fun to play. I cannot control the cars nearly as well as some, especially in the air. I've seen some of the the pro players sail gracefully through the air, always able to achieve such incredible height and accuracy. Meanwhile, my car can only tumble through the arena like a punctured CO2 cartridge. Regardless of this, I still have a blast whenever I boot up the game. In an earlier update, the developers added a hockey based mode that proved to be so popular that they brought it back for the regular match rotation. The game's fluid play and innumerable variations help keep every match fun and unpredictable. If the gameplay in the trailer is as fun as it looks, I expect the Hoops mode to be very popular. The way that Psyonix has handled Rocket League is a perfect example of how a game should be supported post release. The regular updates have added a ton of meaningful free content, the paid DLC doesn't unfairly favor the players that buy it, and the addition of console to PC cross-play is a seriously important move for the industry. By showing that play between platforms is viable, they have blazed a trial that hopefully numerous other games will be able to follow. The Hoops update drops April 26th for PS4, Xbox One and PC. The NBA DLC will cost $1.99 and features flags for all 30 NBA teams. If you are interested in watching the Championship matches, you can visit the league's official website for links to the latest games.